Founded more than 60 years ago, Kirkman® Labs is recognized as a leading provider of nutritional supplements formulated to meet the special health needs of individuals. Kirkman® Labs’ mission statement has always been to provide unique and effective products that are designed to have a positive impact on the health and wellness of individuals with special sensitivities and dietary requirements. All Kirkman® products are manufactured in their own cGMP and NSF certified facility in compliance with the highest industry, regulatory and extensive internal standards. 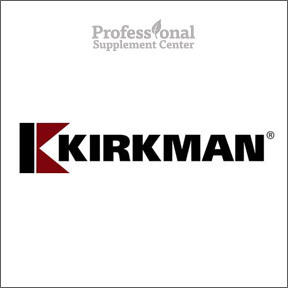 Kirkman® sources premium ingredients from well established top quality suppliers who must meet Kirkman’s own rigorous standards of product testing, identity, quality, safety, stability and purity. With safety and effectiveness their primary concerns, Kirkman® pioneered an Ultra Tested® line of products that are tested for more than 950 environmental contaminants, far exceeding FDA requirements for testing of raw materials and finished products. Every raw ingredient and all finished products are thoroughly tested for potentially harmful pesticides, herbicides, chemicals, endocrine disruptors, bacteria, yeast, mold, 24 heavy metals and common allergens including casein, gluten, soy and peanuts. For those who are gluten sensitive, all Kirkman® supplements are gluten free in the lowest traceable amounts of 5 parts per million. Pro-Bio Gold™ – Hypoallergenic – Considered their signature probiotic, this formula offers broad-spectrum, high-strength, comprehensive resident and transient microorganisms that aid in maintaining and promoting a healthy gastrointestinal tract. Potency, identity and long-term stability is guaranteed through independent testing. EnZym-Complete/DPP-IV™ – Kirkman’s most popular broad-spectrum, high-strength digestive enzyme complex is formulated to support maximum digestive activity for a full range of foods. This product contains a unique blend of 18 pure, plant-based enzymes recognized as essential for effective digestion of proteins, carbs, fats, sugars, and fiber under a wide range of pH conditions. The inclusion of the DPP-IV™ enzyme supports the body’s ability to degrade peptides resulting from casein and gluten. Advanced Adult Multi Vitamin/Mineral – Hypoallergenic – This proprietary formula is formulated to offer comprehensive nutrition and is ideal for those with sensitivities or special dietary requirements. In addition to 12 vitamins and 8 minerals , the formula provides antioxidant support with CoQ10 and Resvida™ brand resveratrol. Free of common allergens and ingredients that may trigger sensitivities. Should you have any questions about these or any other products from Kirkman® Labs, please call or email Professional Supplement Center. This entry was posted in Home and tagged Advanced Adult Multi Vitamin/Mineral, EnZym-Complete/DPP-IV, Kirkman Labs, Pro-Bio Gold, Professional Supplement Center, Vitamins and supplements, www.professionalsupplementcenter.com. Bookmark the permalink.